A test of "tactical urbanism" makes for spontaneous playtime at the park. 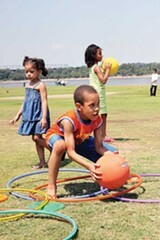 Kids at Tom Lee Park enjoy and urban experiment. What would happen if you dropped a box of toys — kick balls, hula-hoops, and sidewalk chalk — in a crowded park? That's what a handful of Memphians set out to discover two weeks ago in Tom Lee Park . "We noticed how crowded Tom Lee Park was, but kids were just hitting each other with sticks and throwing rocks at each other because there's nothing to do when you're down there," said Memphian Tommy Pacello, one of the unofficial playground scientists behind the experiment. "We thought, wouldn't it be cool if there were a box truck with all kinds of play equipment in the back, like beach cruisers and soccer balls and giant chess sets? Just stuff to activate the public space." So Pacello, Abby Miller, Clay Braggs, and Patrick Hendricks took a break from their work on the Mayor's Innovation Delivery Team, which is working to reduce gun violence and boost the city's economic recovery, and passed a hat around the office to take up a collection. Their donations bought $120 worth of toys to take to the park. The results? Once park-goers warmed up to the idea of this collective toy chest, a kick ball game broke out. Kids flocked to the sidewalks to draw with the chalk. Their parents soon joined in. "Lo and behold, it worked," Pacello said. This kind of guerilla merrymaking isn't totally unheard of: It's an example of "tactical urbanism," the idea that innovative, small-scale ideas can create large-scale change in communities. For instance, the "New Face for Old Broad" project in 2010, which used pop-up shops and DIY bike lanes to show the neighborhood's potential, led to millions of dollars in actual investment. And for $120 dollars worth of toys in a cardboard box, Pacello and his cohorts demonstrated an interest in this loosely organized recreation at a local park, an interest that could, down the line, lead to more investment — maybe even the traveling toy truck they originally envisioned. "The whole concept is to pilot a project and see what small projects work so you don't spend a lot of money up front," Pacello said. "Test them out, and then if you're successful, you can scale it accordingly." 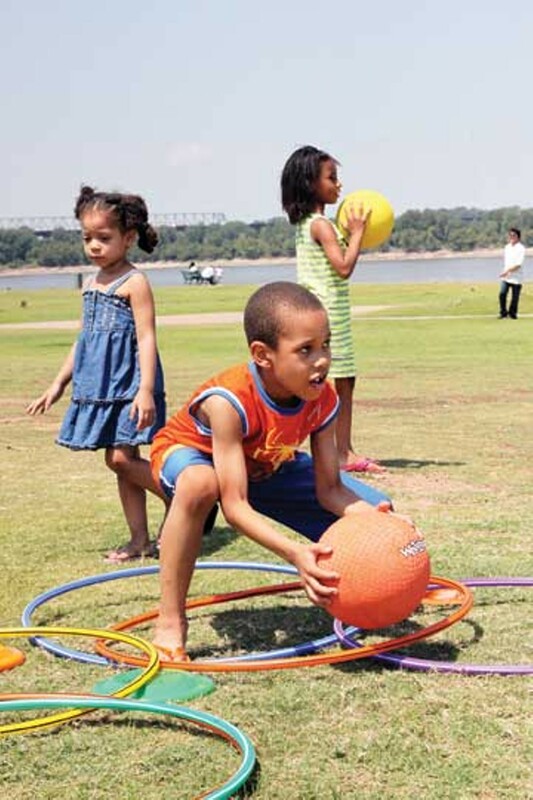 But even if the experiment doesn't lead to a bigger financial investment or turn into a large-scale project, innovative ways of engaging public spaces — take Hattiloo Children's Theatre's pop-up performances in parks, for instance — offer a unique experience for Memphians. So for now, Pacello and his crew hope to inspire other guerilla groups to take action — maybe starting a spontaneous game of kickball or a spur-of-the-moment round of hopscotch. "We want to see people get more involved in Memphis and do more cool stuff and be more whimsical," he said. "Because that's what you see in other cities right now — people are just out there making their cities great places."